When it comes to wedding dress garment bags... this is a subject most brides don't really think about much. Most of the time, the bridal shop you purchase your gown from will give you a wedding gown garment bag. You assume that what they give you is the best choice for your gown, but is it really? "Notice the picture to the right is of two bridal gown bags. Both are 72" long vinyl garment bags made for wedding gowns. One has a 10" gusset, which is the standard garment bag which is what most bridal shops give out. The other is a 20" wide bridal bag for very full bridal gowns, which are not always easy to find." The most popular wedding gown bag right now appears to be the "breathable" bridal bag. This particular bag is made out of a material that will allow air to pass through it. This is more desirable than the vinyl bag if you are going to store your gown in it for an extended period of time. But what about for the short term use, which is best? My personal opinion is that for the short term... I feel that the vinyl wedding dress garment bag is best. Why? Well... I like it because it protects against moisture. 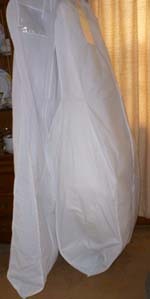 When you are out in the rain with your gown you need a bridal dress bag that isn't going to allow your gown to get wet. Now both the vinyl and breathable gown bags can rip or tear. So which one is easier to repair? Most of the time you can tape the bag back together. It is easier for tape to adhere to the vinyl material than to the breathable fabric. "So based on my experience... I think the vinyl gown bag is the best choice to use since you are transporting your gown a lot before the wedding and it protects best against moisture. But after the wedding, if you plan on leaving your bridal dress in the garment bag for a long time you need to store it in a breathable bag." Which Gown Garment Bag Should I Use When I Travel? This is a good question. If you will be traveling to your wedding destination by plane, which bridal garment bag would be the best bag to use? I feel you should "double bag" your gown if you will be carrying it on the plane and not packing it. You can use two vinyl bags or one breathable and one vinyl on on the outside to protect against moisture. Remember what I said about bags tearing and zippers can break. What would you do in the middle of the airport or on the plane if this happens? That is why two wedding dress garment bags are better than one. If your outer bag tears or the zipper breaks you can switch the bags around. I'm not a fan of the bell shaped garment bag because there is no gusset it and it will be harder to fit a gown with a train in the bag. The 72' with a 10 inch gusset bridal garment bag is the most popular size used, because it is an adequate size for most gowns. But there are times when the 10 inch gusset wedding gown garment bag is not big enough. 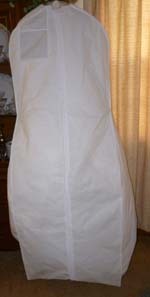 The 72" wedding dress garment bag with a 20" wide gusset is needed for the big poufy dresses or gowns with long trains. You know the styles that have the pick up style skirted gowns, gowns with multiple ruffle tiers and the big ball gown wedding dresses, all need more room. When you try to put these very full gowns in the 10 inch gusset bags, it doesn't fit well and compresses the gown. If you have your gown pressed or steamed, when you take it out of a bag that is too small, it will look like you never pressed it. But the 20 inch gusset bag will not only accommodate your gown, but with room to spare in most cases. And your gown will stay looking great after steaming it. I bet before reading this article you didn't really think it mattered which wedding dress garment bag you chose. Hopefully you now know which one will best suit your circumstances. 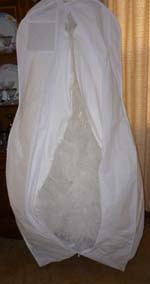 "The wide gusset bridal garment bag above can easily accomodate this poufy full skirt ruffled wedding gown. It doesn''t crush the design and will not ruin the pressing/ steaming job ." When it comes to protecting your investment... your wedding gown... pick the right bridal gown garment bag.